Playing video on iOS is kind of like Henry Ford’s Model T: You can use any file you want, as long as it’s an MP4. But with the return of a once-missing app, your options for video formats may soon increase. VLC is a popular media-playback app on the desktop—an open-source project, it runs on Mac, Windows, and Linux. And, once upon a time, it was even available on the iOS App Store. Just a few months later, however, it was forced out, thanks to a licensing dispute. That issue has now apparently been resolved, and VLC is back in the App Store as version 2.0. The goal of the free app remains the same: Play any video files you throw at it. While the app itself could reasonably substitute for iOS’s built-in Videos app, it offers a number of additional features beyond just greater codec compatibility. For starters, in addition to being able to transfer files to VLC over iTunes File Sharing, VLC can also download a file from a URL, view a network video stream, or access files from your Dropbox, if you give it permission. There’s also a built-in Web server that lets you upload files directly to VLC, à la Good Reader, but I couldn’t get it to work in my quick tests. 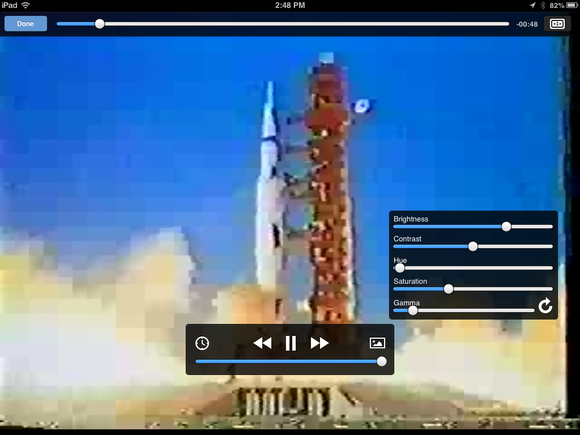 VLC offers powerful video controls that you can use during playback. As video goes, VLC seems to be kind of a mixed bag. Even in a quick test, I found that not all videos played back correctly—especially the sound. In one video file it was distorted—in another, it didn’t play at all. The app does offer powerful video adjustment controls that you can use during playback, adjusting brightness, contrast, hue, saturation, and gamma; there’s also a playback speed slider that lets you adjust from between 0.25x to 4x. Besides that, VLC offers only a scant few features (though admittedly more than iOS’s own Videos app). You can choose the text encoding of subtitles, enable audio playback in background, turn on time-stretching audio, and choose the aggressiveness of the deblocking filter. The arrival of VLC raises a bigger question: Almost three years ago, when the app debuted, it was considered a useful tool for freeing users from the requirements of using MP4-encoded video. But in the intervening time, the popularity of iOS has ensured that MP4-encoded video has become a staple of the Internet—at least as plentiful as MP3 audio files. As nice as it is to have the option of something like VLC, the vast majority of users probably will never have need for the app—but it’s good to know it’s there.